'Swanage' - an Original 'West Country' class in 5" gauge. Ours is a great hobby, and I have been able to teach model engineering as an evening class in the local college, which has gained in popularity over the last 15 years. As a professional engineer, used to working to fine tolerances in the aero industry, machining from solid is the norm, so I've not used any castings in constructing my new loco. Previously models include a Bassett-Lowke 0-6-0 in 3 1/2" gauge, a Simplex, and a 5" gauge Britannia - which has been successfully passenger hauling at the Club and rallies for over 20 years. I was struck by how similar the Britannia boiler was to the Bulleid, so decided to tackle the West Country. I chose 'Swanage' as I have fairly easy access to the full size loco on the Watercress line, and it will be finished in late B.R. green livery with the cut down tender as it appears on the Railway. Dimensions have been taken from Works drawings which have enabled me to get most of the detail right, and has taken 10 years so far. All the wheels have been machined from solid, including the undercut on the outside edges of the recess, and the drivers have been case hardened - though I'm not quite sure yet what that will do for track adhesion. The centre crank axle will be set at 120 degrees as per full size, and since the middle cylinder is inclined above the others, this will result in a prototypical slightly uneven beat. The cylinders are machined from continuous flow cast iron, which is great to machine and has no blow holes; these will be fitted with bronze pistons and C.I. piston rings. Although I'm fitting mechanically operated drain valves, the end covers will also have automatic relief valves set to about 50psi, using schrader tyre valves. The boiler was built for me by John Ellis and is very close to a Brit. boiler except for moving around the safety valve bushes and other minor items. 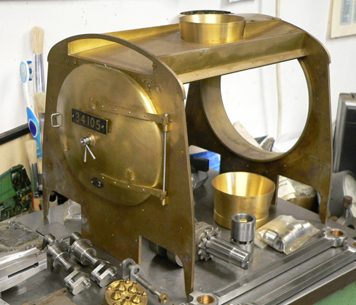 The smokebox is made from 1/16" brass with removable side panels, and will house the regulator made from a compressed air ball valve, fitted to stainless supheaters, and a disk type snifting valve. The external casing will similarly be removable in large panels. The chain driven gear will use 8mm Reynolds chain, and I intend to fit disks on the outer edges of the axles in to sump which should throw any oil away from the axlesboxes. There will be an oil pump on the rear axle which will pick up oil from the sump and feed it through a gallery of pipes across the motion. I'm not bothering with an axle water pump, having sucessfully relied on just injectors on Britannia for 20 years. I have found the Chiverton ones more reliable in the hard water of the London area, but I fill them with WD40 after use and this stops limescale building up on the cones (but remember to flush them before use). 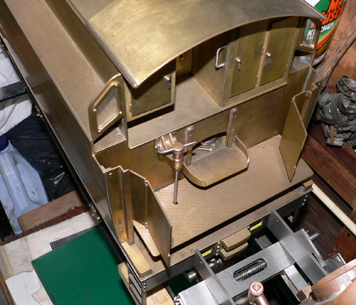 The majority of components have now been constructed, and as can be seen from the photos, the tender is also well advanced. Although I have just about technically retired now, family commitments and catching up with all those jobs I needed to do, has meant I've done no work on the new loco for about a year. But watch this space, I'm clearing the decks to have a real push on this soon.